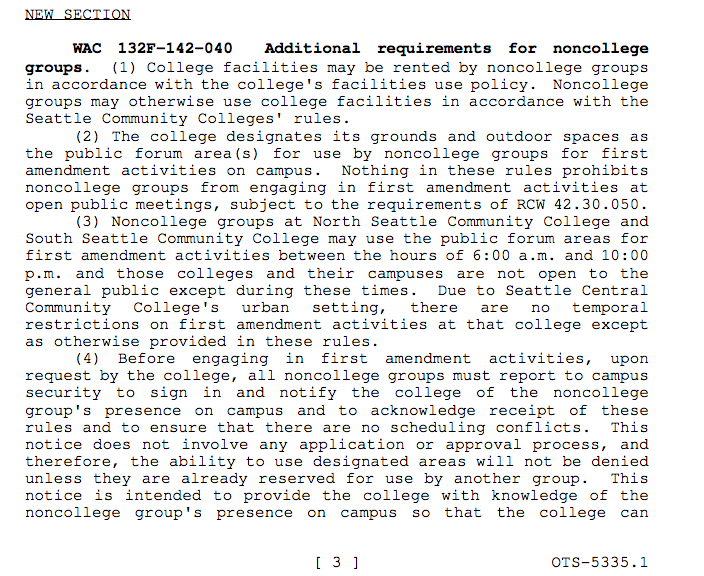 The American Civil Liberties Union (ACLU) recently took a stab at the Seattle Community College District’s attempts to rewrite free speech policies at college facilities by calling their amendments ‘unconstitutional’. In this ongoing negotiation between the district, faculty, and free speech advocates, the administration is once again running up against opposition for its consistent attempts to try and limit a basic constitutional right. These moves by the administration were first initiated in response to Occupy Seattle’s encampment on Seattle Central’s campus, sending a clear message to the community that the suits up top were trying to squash similar future events of protest or civil disobedience from occurring on college property. It resulted in an uproar and the debate has been a tug-of-war ever since. This is the language that the ACLU has beef with, due to its potentially restrictive and controlling nature. It seemed that there was approval on all fronts but the ACLU has dashed that misconception. Though seemingly innocent in its nature and vastly liberal compared to what was originally brought to the table, the language in Chapter 132F-142-040 leaves elbowroom for some less than ideal situations. It allows for college approved groups to gather freely, while non-approved groups must ‘check-in’ first, giving the school their phone numbers, group affiliation and personal addresses, while also allowing ample time for security services to grab their mace and batons and call their city affiliates in blue to the scene with minutes to spare. The legislative changes don’t go up for a vote with the district Board of Trustees till December 5th, leaving a short amount of time for potential debate and discussion. While the district has acknowledged the letter following the Times article, a concrete response has yet to surface, though it will probably be something along the lines of maintaining campus security and ensuring uninterrupted class time. However it again raises some questions about the motivations behind the amendment. Though gatherings such as the Occupy Seattle or faculty protests might be a hassle for admins, the allowance of such activities are a very necessary and vital component of any college institutional framework. Whether people like Vice Chancellor Carin Weiss or SCCC President Paul Killpatrick honestly think that limiting free speech will keep campuses safe, or, more villainously, want to maintain their vision of colleges being a nicely ordered factory line operation for churning out obedient minds to fit the modern American work place without any interruptions, their actions only tighten the noose that the administration seems to be slyly slipping over the necks of the Seattle Central Community. People have a right to make their voices heard, and in these times it’s more important than ever. PDF versions of the WAC proposal can be found here.